By hook and by crook and a great deal of determination, the once semi-industrial area around the old Pearl Brewery in San Antonio, TX is gentrifying; renovate the buildings, slap in some top-grade landscaping and bring in the right mix of retail stores, eateries and offices, schedule something like a regular farmers' market on Saturdays, and the yuppie herds descend in droves. I do not mean to sound snide, by the way - I just appreciate the effort, believing as I do that a neighborhood ought to be yuppified enough to be safe, but still scruffy enough to be interesting. The neighborhood around Josephine and Grayson, just off 281 pretty well hits the mark, with the added benefit of being on the northern edge of the Riverwalk extension. 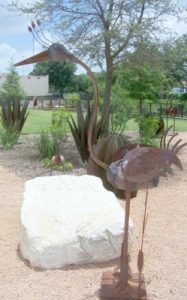 Oh, how we love the Riverwalk - just can't get enough of it, here in San Antonio; eventually, I believe that riverwalk extensions and parks will go all the way through the city, from San Pedro Springs, all the way out to 1604 . . . I was drawn to the Pearl last weekend by a book-signing at the Twig, for a book that I had worked on for Watercress Press, the tiny subsidy publishing bidness, at which I am junior partner. When the author's pocketbook permits, we can do some very nice, high-end books indeed: History, Texiana, memoirs, some poetry - that kind of thing. Our latest publication, A 21 Story Salute combines two of our favorites; history and memoir. 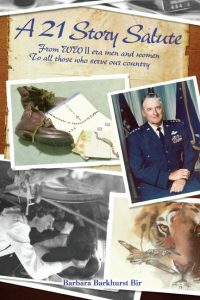 Barbara Bir, the author/editor went around to twenty-one World War II-era veterans and a couple of spouses, and interviewed them about their experiences during the conflict, and about their lives afterwards. All were pretty interesting, in themselves, but a good few of them were downright fascinating; it depended, I think, on how good a story-teller they were. 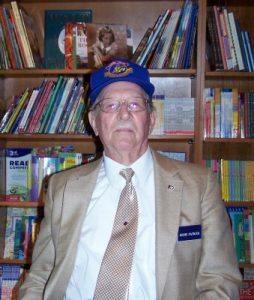 A handful of them were at the Twig for the signing: Eddie Patrick was a kid genius, when it came to radios and electronics: he wound up as a senior NCO at the age of 19, serving at a Flying Tigers airbase in China, well behind the Japanese lines. Bob Joyce kept a diary, all through his tour of duty as a B-17 radio operator, flying a series of dangerous missions from Italy. On those missions, he carried a pair of regular Army boots, his father's rosary, a good-luck bracelet from his home-town girlfriend, and a $2.00 bill, so he would never be broke. 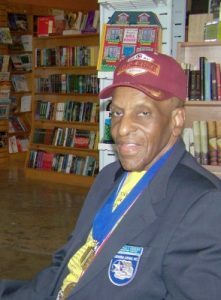 And Granville Coggs went from being a Tuskegee airman at the very end of the war, to being a medical doctor, inventor, musician and senior athlete. Afterwards, we wandered out the back, towards the parking lot where the weekly farmers' market is held on Saturdays, and discovered that . . . well, stuff had changed since we were there last. 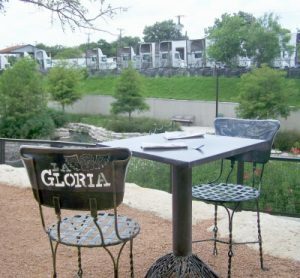 La Gloria has opened at the far corner of the parking lot, overlooking the Riverwalk extension, and oh, my - what a treat. La Gloria advertises authentic Mexican street food. I wasn't hungry but my daughter was, and she indulged herself with a pork and cheese quesadilla - which she said was absolutely splendid, and just the right size to satisfy without filling up. There were a fair sprinkling of other patrons on a mid-Sunday afternoon - and the food they had all looked and smelled good. 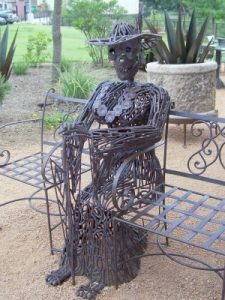 There's a terrace, with a water-misting system in place, and tables and chairs set out in a garden area, landscaped with boulders, trees and an array of quirky metal statues. Honestly, we could not think of a better place to take guests from out of town, to sample authentic Mexican food, on the Riverwalk - and where the parking would be quite a bit easier than going all the way downtown.